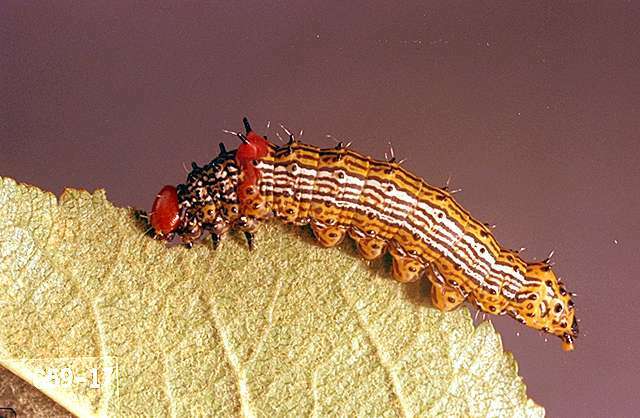 Pest description and crop damage The redhumped caterpillar is one of the most widely distributed and commonly encountered large caterpillars in North America. 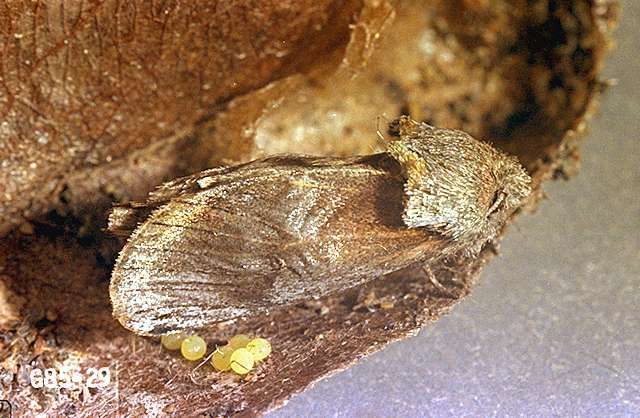 Although the adult moth is an inconspicuous gray moth, the mature larvae are one-inch long and are reddish or yellow and have several spines on each segment. The entire body is lined with white, dark reddish brown, and black lines. The head is red, and the fourth segment behind the head is humped. Larvae usually appear in midsummer and consume the whole leaf, leaving only the midrib. They can completely defoliate individual branches and even entire young trees. Biology and life history The insect overwinters as a mature larva in a cocoon in the ground. It pupates in early summer, and adult moths appear in June and July. Eggs are laid on lower surfaces of leaves. The caterpillars emerge and feed in groups through September, at which time they move to the ground to construct their overwintering cocoon. Pest monitoring Examine trees for feeding damage in early summer. Bacillus thuringiensis kurstaki-Some formulations are OMRI-listed for organic use. Bacillus thuringiensis kurstaki (Dipel, Javelin, and others)-Check label for rates. REI 4 hr. PHI 0 days. Nontoxic to bees. This biologically derived material acts slowly. Some formulations are OMRI-listed for organic use. flubendiamide (Belt 4SC) at 3 to 4 fl oz/a. REI 12 hr. PHI 7 days. methoxyfenozide (Intrepid 2F) at 8 to 16 fl oz/a. REI 4 hr. PHI 7 days. Apply when egg hatch begins or at the first sign of larval infestation. Reapply as necessary in 10 to 14 days. Do not apply within 25 ft of aquatic habitat, 150 ft if applied by air. spinetoram (Delegate WG) at 4.5 to 7 oz/a. REI 4 hr. PHI 7 days. Entrust SC at 4 to 8 fl oz/a. REI 4 hr. PHI 7 days. OMRI-listed for organic use. Success at 4 to 8 fl oz/a. REI 4 hr. PHI 7 days. Results are best when applied at petal fall. May act slowly.